Ok so I’m totally aware that everyone and their grandmas have a podcast these days. But if you know me, I will try again I put my mind to. And I have put my mind to something! I thought, I love listening to podcasts on my commute to work, I could totally create my own! And So I did. And surprise, surprise – it is all about pocket page scrapbooking! You may remember that my One Little Word for the year of communicate. Well, I am communicating to you in a variety of ways – through writing this blog and through a podcast, called Pocket Talk. 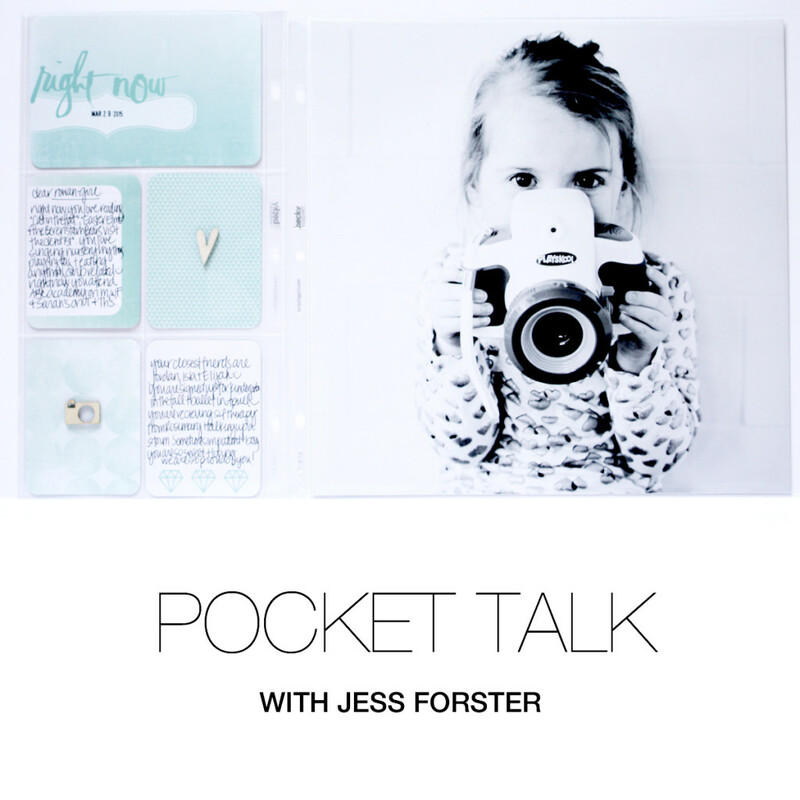 In Pocket Talk, I interview pocket page scrapbookers from around the world about their creative process. Designed to educate and inspire, this show will answer specific questions you may have about pocket page scrapbooking. Every two weeks, I will release a new episode for your listening pleasure! On today’s show, I speak with Donya Gjerdingen of DonyaLuana.com . Starting Project Life in 2012, Donya has successfully stuck with traditional pocket page scrapbooking for the past three years. In 2014, Donya was on the Becky Higgins Project Life Creative team and is currently on the Ali Edwards and One Little Bird Digital Design Team. When it comes to creating pages, Donya is the master at mixing black and white and colour photos. She also pays attention to detail, adding fun digital elements to her journaling cards. For those starting out, Donya gives specific tips on how to mix black and white photos at 12:30 minute mark of our conversation as well as ways to develop your style around the 19:00 minutes. On today’s show, I speak with the kind and creative Petra Corcoran of Brisbane, Australia. When she is not working as an CFO at an IT company, Petra is documenting daily life with her husband and three children on the “Gold Coast”. Petra was on the 2013 Becky Higgins Project Life Creative Team as well as the Sweet Shoppe Design Team. Completing Project Life for the last four years, Petra discusses how she involves her family in documenting and reviews how she prints her photos at home. This is a great episode for anyone interested in completing a Photo-a-Day Challenge in their 2015 albums. For more information about Petra, including her weekly project life layouts, how to videos and simple scrapbooking projects, please check out her blog at: PetraCorcoran.com. On today’s show, I speak with the amazing, Rachel Del Grosso of Las Vegas, Nevada. An avid writer all of her life, Rachel transitioned into pocket page scrapbooking when she and her husband, Dom where expecting their son, DJ. Rachel was on the 2014 Becky Higgins Project Life Creative Team and currently is on 2015 Kellie Stamps Design Team. On this episode, Rachel opens up about struggling to find her personal style, how she saves time and money completing her weekly pocket page spreads and how she includes the small details of her week.For more information about Rachel or her shop, please visit her blog, Big City Quiet. On today’s show, I speak with the fun and fantastic Lindsay Wright. A teacher / mixed media artist, Lindsay and Jess met in the fall during a project life crop. Although Linsday doesn’t consider herself a scrapbooker, she recently started to document family life with the Project Life App. In this conversation, Lindsay shares how she recorded a whole year in one month, why design K, N and P are her favourite page protectors and the types of pens she uses to right on her Project Life prints. For more information about Lindsay, please visit her blog or her etsy shop. On today’s show, I speak with the prolific and passionate Autumn Nguyen. When she is not teaching science to grade 8 students, you can find Autumn documenting family life with husband, Jim and son Samuel, on her instagram account: @simplyautumnnguyen. As a 2014 Becky Higgins Creative Team, it is quick to see this memory keeper has embraced Project Life as a way of life. In this episode, Autumn shares how she organizes the 100’s of photos she takes every week, her work flow during crops with friends and how she has completed Project Life for the past 5 years, through various ages and stages­­. I am so inspired by Autumn’s enthausiam and I think you will be too! 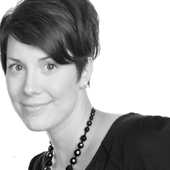 On today’s show, I speak with designed focused and determined, Steffie Van Den Akker from the Netherlands. When she is not running after her two young sons, Julius and Oskar, or spending time with her partner Mark, Steffie volunteers as a photographer at a local hospital where she takes pictures of parents and their premature babies. Currently on the Laurel Lane Design team, what drew me to Steffie was her clean and modern Project Life Pages she shares on her instagram account. In this episode, Steffie discusses her love of white cardstock; how she documents family life in her monthly layouts and why she uses minimal supplies. This is great conversation for anyone interested in how to find their own unique pocket page style! On today’s show, I speak with the articulate educator, Jennifer S Wilson. From Champaign, Illinois, Jennifer is the wife to Steve and mama to daughter, Emma. As the owner of Simple Scrapper, Jennifer helps thousands of scrapbookers to focus on what matters most. In this episode, Jennifer shares how she combines pocket pages & the library of memories system, how she uses smart phones & DSLR photos in her layouts & why she considers pocket pages as “art journaling for left brainers”. This is a great episode for listeners interested in how to balance making pocket pages and traditional layouts. On today’s show, I speak with the crafty and creative, Kellie Winnell of Give a Girl a Blog. From Victoria, Australia, Kellie is the wife to Luke and mama to 3 daughters: Kira, Chloe and Heidi. Currently on the Big City Quiet Design team and owner of Kellie Stamps, her own online stamp shop, what I love about Kellie’s pocket pages is how she documents her sense of humour and shoe collection. In this episode, Kellie shares her favourite embellishments, inks and iPhone apps and what she’s currently struggling with. This is a great conversation about different journaling perspectives and how to include your kids in the Project Life process. On a side note: a huge thank you to Kellie for her patience as we recorded multiple times over a poor Skype connection! On today’s show, I’m speaking with the lovely Tiffany Barker aka Grey House Lane. Trained as an occupational therapist, Tiffany is the wife to John and stay-at-home mama to Kaley, Carolyn, Jake, Maggie and Amelia. Currently Tiffany is on the Big City Quiet and Love Day Seed design teams. Tiffany also sells her own digital Project Life products at her etsy shop. Calm and focused, you can see all of Tiffany’s pages on her instagram account. In this episode, Tiffany shares how her style has evolved, her favourite lens and how she has developed her, “I just want to have fun attitdue”. This is a great upbeat conversation about bringing fun back to memory keeping. On today’s show, I speak with the sweet and stylish, Meghann Andrew. Trained as an interior designer, Meghann is the wife to Simon and stay-at-home-mama to Lizzy, a micro premie who is now 2 years old. Currently Meghann is on 4 design teams including: Elle’s Studio, Chickaniddy Crafts, Jot Magazine and the Scraptastic Club. 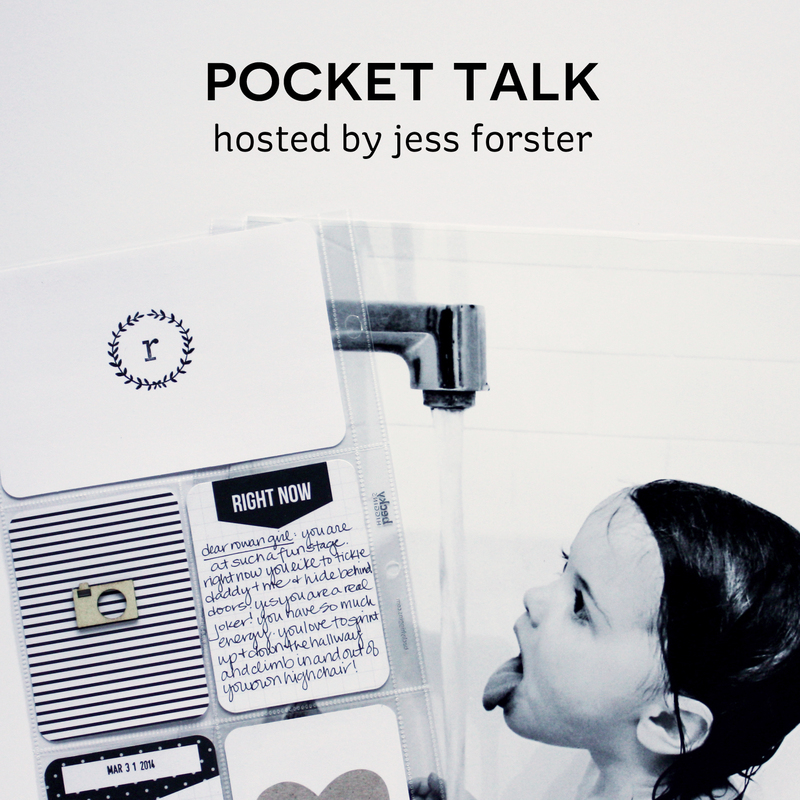 In our conversation, Meghann discusses how she photographs pocket pages for design teams, her favourite go-to photo paper, and how she uses the collect photo app for completing Project Life and traditional pages. This is a great episode for memory keepers interested in incorporating pocket pages into their traditional scrapbooking process but who aren’t sure how to start. On today’s show, I am speaking with the super crafty and creative Trisha Harrison of Here at Number 30. Trained as a dental hygienist, Trish is the wife to Tyler and the mama to son, Ethan and daughter, Ava. If you are like me, you are a super fan of how Trish’s work and how she simply elevates everyday documenting. Trish has been on the 2014 Becky Higgins Project Life and Paislee Press’ Creative Teams. Currently she is on the Ali Edwards Design Team. In our conversation, Trish discusses her perspective on establishing a creative habit, she shares her crafting playlist and shares how Project Life has helped her cope with grief and loss. On today’s show, I speak with Jen Carlson. Originally from St. Louis, Jen now lives in North Carolina with her fur children, dog / Winston and cat / Gracie. By day Jen is a process engineer and by night she is an avid scrapbooker. Don’t believe me? Listen to the list of design teams Jen is currently on: Ali Edwards Design Inc,Colorcast Designs, One Little Bird, Sahlin Studio and Amber LaBau Designs! You can also check out Jen’s work on her drool worthy instagram account: @jecarl. What stands out in this conversation is Jen’s clearly defined process for mundane tasks like downloading and printing photos. In contrast, she then follows her inspiration to create pages. Jen discusses tips for taking great photos on a DSLR and how she approaches storytelling on her pages. On today’s show, I am speaking with the passionate and persistent Jessica Upton. Living in Colorado Springs with her husband Keith and her kids, McKenna, Riley and Kiefer, Jessica is the owner of the embellishment company, Colorcast Designs. Jessica has been a scrapbooker for the last 14 years and currently she is on the Sahlin Studio Design Team and the Amber LaBau Creative Team. What drew me to Jessica’s modern & colourful pocket pages is her ability to create texture and visual interest through the use of simple embellishments. During our conversation what impressed me the most about Jessica’s process is her clear sense of purpose for creating. In our chat Jessica discusses the rewards and challenges of owning her own business and what it’s like to manage a creative team and how she keeps herself accountable to create pages. On today’s show, I am speaking with the sweet and stylish, Emma from the website Create the Simple. Living in the UK with her husband, Emma works in London in finance and carves out time for memory keeping on evenings and weekends. Currently she creates for Ali Edwards Design and Kellie Stamps. What I love about Emma and her layouts, besides her clearly defined colour schemes, is how she has adapted her process & pages to fit her memory keeping goals. In our discussion Emma tells us her favourite fonts, why she switched from 6×8 to 6×12 and when she is most productive. On today’s show, I am speaking with the charming and clever, Emily Webster (aka Emily Records). Living in Northern California with her husband Jeremy and daughters Sienna & Riley, Emily learned Photoshop in highschool and now is a digital scrapbooker. Currently she creates for Paislee Press & One Little Bird Designs. Formerly she was on the Ali Edwards Design Team – her first design team ever! What I love about Emily is her resourcefulness and “can do” attitude. In our conversation, listeners will learn Emily’s three mantras for scrapbooking & how she uses her smart phone and computer for completing weekly layouts. This is a great conversation for anyone interested in scrapbooking on a budget using pocket pages. On today’s show, I am speaking with the incredibly inspiring Diana Sanchez aka The Lovely Pear. Living in Midland Texas with her husband Shawn, son A&J as well as two dogs & two ducks, Diana is currently on the 2016 Becky Higgins Project Life Creative Team. As a Project Life newbie, Diana has only been scrapbooking since June 2015. Her passion and enthusiasm for pocket page scrapbooking reminds us to “just start”. Check out Diana’s drool worth Instagram account or her amazing 2016 title page – one of my favorites! In this conversation we discuss how Diana got started scrapbooking with Project Life, the resistance her friends express to scrapbooking & how she styles her finished layouts for social media. We also chat about her favourite actions. On today’s show, I chat with the energetic and creatively enthusiastic, Barbara P. Living in Sacramento, California with her husband Larry and her daughter Simone, Barbara has scrapbooked since 1999. Formerly a Studio Calico Design Team member, Barbara currently creates for ColorCast Designs, Kelly Purkey Shop and is a teacher at Big Picture Classes. In our conversation, Barbara discusses her evolution from traditional to digital to pocket page scrapbooker and her favorite colour and font to create with. Barbara also reflects on what kind of crafter she is. This is a really fun chat that will make you want to scrapbook! On today’s show, I have another special roundtable episode. Jessica Upton of Colorcast Designs, Kellie Winnell of Kellie Stamps and Tracy Banks from her Mercy Tiara youtube channel, discuss how their are tackling their December Daily projects. Guests discuss a variety of approaches to documenting the holidays including incorporating their photos into an existing Project Life album and how to balance self care with being an intentional documenter during the month of December. This is a motivating conversation for those in the middle of completing their 2016 December Daily project. On today’s show, I speak with the wonderful and whimsical Kelli Rich. Known online as Forever and a Day Create, Kelly lives in Utah with her husband Quincey, and three sons: Radley, Greyson and Crew. A hairstylist by day, Kelli designs beautiful layouts for Coco Daisy and makes and sells adorable bow ties for kids. I love Kelli’s use of white space and bright & bold pops of color on her pages. In this conversation, we discuss living with our memories, color choices and how she chooses between documenting in her planner vs. a mini book vs. a scrapbook page.